Winds out of the east at 15 mph, seas running 3-5 ft., water temperature 75 degrees here in sunny, vacation land Fort Lauderdale FL. 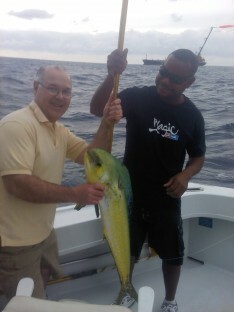 Jim Rasko and Matt Hurt from Cincinnati, Ohio chartered the Happy Day Today with the Topshotfishing team to do some deep see fishing in Fort Lauderdale FL. We started off trolling with two planers down, both with sea witches and Bonito strips for bait and for surface two Ballyhoos and two Bonito strips. Working the reefs, picking away at a couple of King Fish, it was now time to do some live baiting from the kites. Again today there was no current, so I went to our artificial wreck, which is a freighter that was sunk back in 1982. We put a live Goggle Eye down at the bottom in search of a Grouper, Snapper or Amberjack plus two kites with two live Goggle Eyes on each kite. Our first fish was a Mahi Mahi that ate the live Goggle Eye from the left short kite, and Jim reeled him in – this will be their dinner for tonight. While sitting there waiting for bottom rod to bend over, a black shadow appeared on the right short. This Sailfish was very aggressive, grabbing the live bait, screaming off line immediately and tail walking out of the water, making a spectacular show. 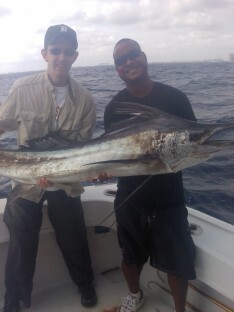 As he got closer to the boat,Jackson held the leader in his hand and the Sailfish exited the water 10 ft. from the boat. This was Matt’s first Sailfish and pictures were wildly taken, afterwards the Sailfish was released.